Building a dog shed will provide your pet with a safe and large environment. This can be done alone, but it may be helpful to have some helping hands. Building your own shed is a great way to save money and rework your building and repairing skills. The size and design of the dog shed will vary on the size of your pet and your own preference. Measure your pet's length, width, and height. Your dog shed should be 6 to 9 inches taller than your pet,11 to 17 inches longer and 11 to 17 inches wider. Determine how much longer, taller and wider you want your shed. It is important that it is not too big so the pet feels safe and comfortable. It may be helpful to draw a plan..
Use 2 by 4 wood to build a base to your determined dimensions. Cut a piece of plywood to fit the base and screw itto the base. Cut three plywood sides according to your measurements. Prop the sides on the base and use duct tape to temporarily hold them up. Screw 2 by 4 pieces of wood on the inside corners to make the walls sturdy and strong. On the fourth piece of plywood cut a door, 3 to 5 inches bigger than your pet. Screw that in place. You can either leave the door space open or build a door out of plywood. If you want a door, cut half an inch off each side of the piece of plywood you cut out for the door opening. Screw two hinges to the one side screw the other side of the hinges. Attach a latch or handle to the door. Cut a roof out of plywood. The roof should hang slightly over each. Screw roof to the sides, making sure each screw goes into the wall. 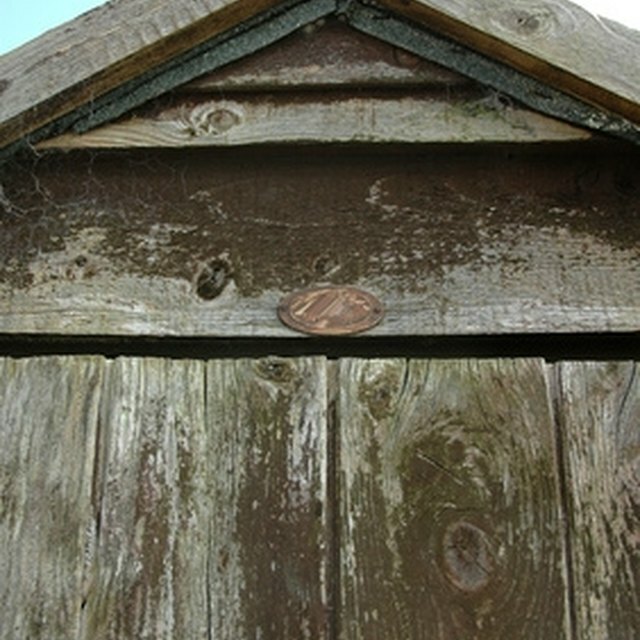 Cover the roof with shingles to make the shed more water resistant. Use shorter screws for the shingles to avoid pet danger. There are many items on the market that can improve the final appearance of the dog shed. You may want to add a water resistant coat to the outside. Using these tools and materials can be dangerous. Be sure to follow the safety instructions on all materials and take precautions. Do not use the saw or screw gun without previous experience.